Last year I made a DIY Christmas Ornament for a mom who had lost a baby. The kids and I loved making the ornament for the mom. It was an amazing process and got me thinking. 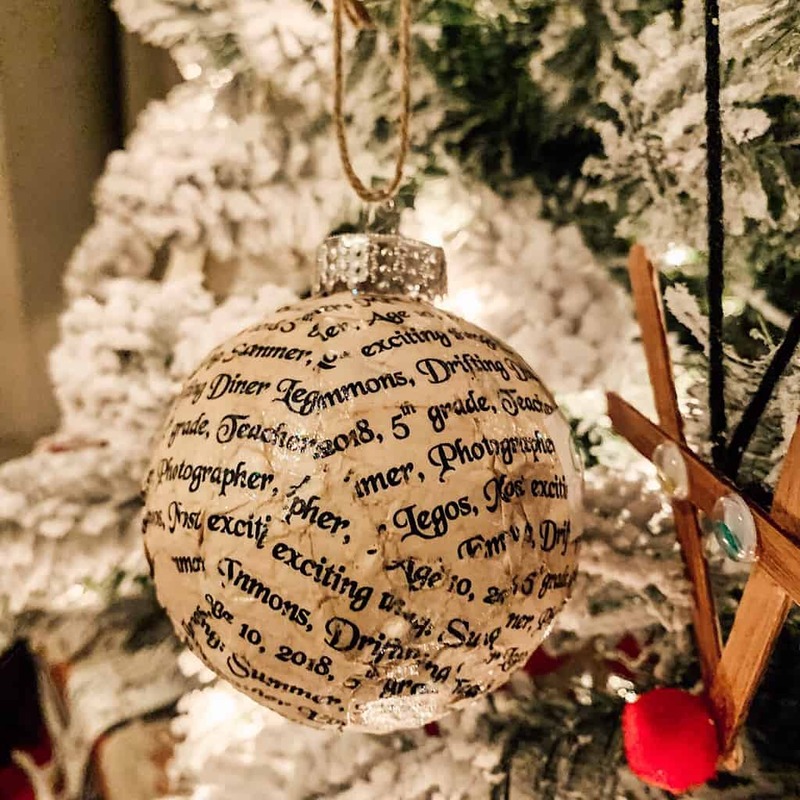 I would love to have a similar ornament. So during the month of August it came to me! 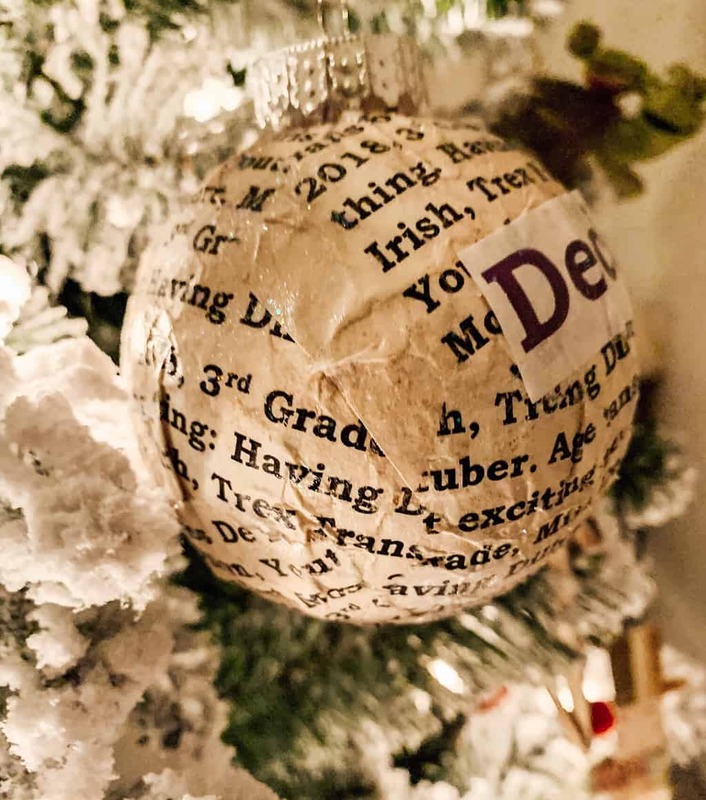 Instead of doing a “this year info chalkboard” like on the first day of school why not make a DIY Christmas Ornament? You know the ones I’m talking about right?! The ones that the kids hold up that tells who their teacher is. What they want to be when they grow up etc?! When I merged the two ideas it came out perfectly! And this happened to be our Advent Activity for today. I asked them these questions. The only rule was they had to answer in 2 words or less. What is the top item you want from Santa? What was your most exciting thing to happen to you this year? When you become older what do you want to be? John Age: 7, 2018 1st grade teacher: Mrs. Smith, Legos, Best thing to happen: Start School, I want to be a teacher when I grow up. 3)I changed the font of their name only to 48 and to their favorite color. 7) I wanted it to look old so I took 3 tea bags and brought them to a boil. Then I placed each paper with their answers on a cookie sheet (I did all 4 at once) and then poured a little of the tea on them. I let them soak until they changed colors (30 seconds). You can use more tea bags to make them darker. Or use colored paper. 14) after the ornament is Covered place the child’s name somewhere on the ornament. And glue down with Mod Podge. 17) let dry took about 20-30 mins. I cleaned up during this time. 18) use twine or ribbon to put on the ornament to hang the ornament on the tree. And that’s it! 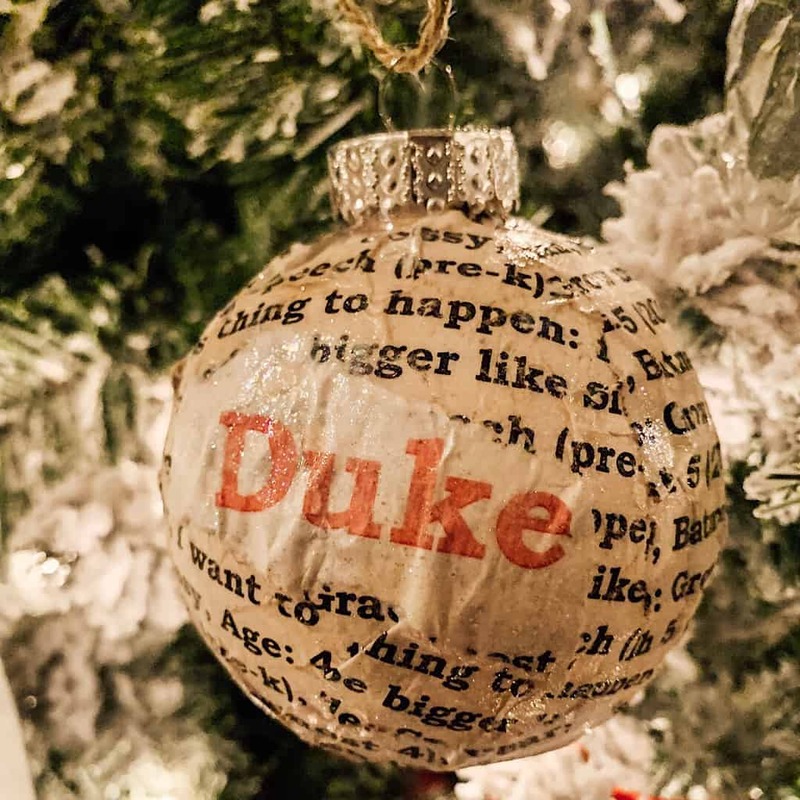 The actual process takes around 30 minutes (other than drying time) of actual prep time to complete this DIY Christmas Ornament! Here are some pictures of the finished products on our non flocked tree! I hope you enjoyed this DIY! And if you decide to give it a try please tag me or comment below! If you are looking for another great activity to do with your kiddos this holiday season click here.